Susan Barrett believes that art is a verb. Her companies, Barrett Barrera Projects and projects+gallery, produce exhibitions and projects that create a dialogue on contemporary issues through art and design. For over 30 years, Susan has fought for the arts to be a part of public transportation, city planning and social change. Susan conceptualized the St. Louis Chess Club and served as the founding executive director of the World Chess Hall of Fame, where she created the exhibit A Queen Within which is still touring internationally. Susan sits on several boards including the Contemporary Art Museum, Arts in Transit, Airport Arts Commission and St. Louis Fashion Fund. 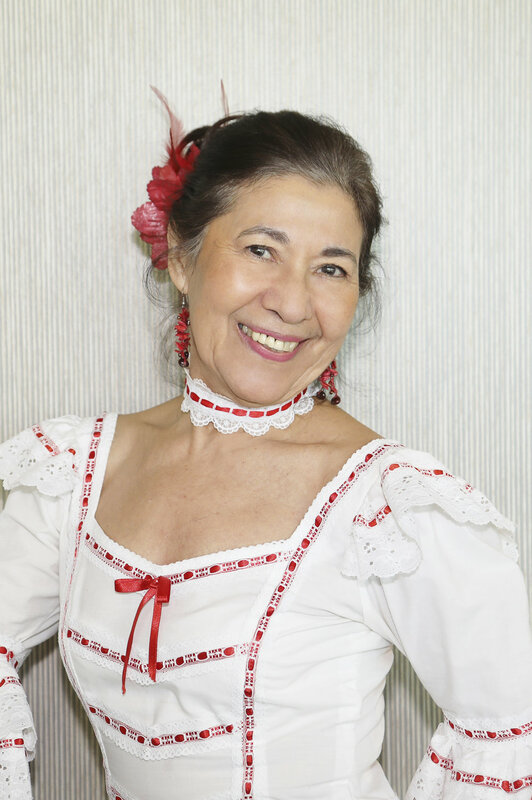 Carmen Dence is the founder and artistic director of the colorful Grupo Atlantico, an instrumental and dance group that promotes the folklore and rich heritage of her native Colombia. She has been recognized as a “Master Artist” by the Missouri Folk Arts Program and has held classes and performances in literally hundreds of schools, libraries, and other venues since 1995. Simultaneously, she pursued a successful career in science at Washington University School of Medicine, where her passion has been mentoring minorities and attracting young women to science. She serves as a board member of the Hispanic Educational Cultural and Scholarship Fund, the Hispanic Scholarship Alliance, and Better Family Life. Kari Ely is a native St. Louisan who has excelled at bringing a wide range of characters to life on the stage. A full-time actress, she has worked for virtually every professional theatre company in St. Louis. Her honors include two Kevin Kline Awards, a St. Louis Theatre Circle Award and countless “end of the year Best-Of’s.” Over the course of her career, Kari has served as a theater instructor at Washington University, SIUE, Stages St. Louis, a private coach and Co-founder/Director of The Make-Believe-Ables. Her most recent venture is to explore a new dimension of creativity as a director. Brea McAnally is co-founder and caretaker of The Luminary, a leading contemporary art space in St. Louis, whose mission supports work at the intersection of art and social concern. Her photography, performances and projects have been featured in The New Yorker, Art in America, San Francisco Chronicle, Gwangju Biennale (South Korea) and Louis Dany (Oslo, Norway). She received a MasterMind Award for excellence in the arts from the Riverfront Times in 2011. Her civic involvement includes serving as Chair of the Arts and Entertainment Committee for Mayor Francis Slay’s Vanguard Cabinet, and Day Chair of St. Louis Design Week. Jacqueline Thompson is an actor, director, and theatre professor at UMSL. She’s worked with The Repertory Theatre of St. Louis, The Black Rep, Shakespeare Festival St. Louis, Upstream, Mustard Seed, SATE, Metro, and New Jewish Theatre. The St. Louis Post Dispatch recognized her as one of six women shaping St. Louis arts and entertainment. She was also noted as one of St. Louis’ most versatile performers. In 2018 she received a St. Louis Theater Circle Award for Outstanding Actress in a Drama and an Artist Fellowship from the Regional Arts Commission. She was selected by the Theatre Communications Group to participate in The Rising Leaders of Color program. Kathie Winter is an unwavering supporter of the arts. Over the years, Kathie has utilized her finance background and fundraising acumen to secure a sound footing for many organizations. She has chaired an impressive number of galas including events for Grand Center, The Big Muddy Dance Company, Circus Flora, Stray Dog Theatre, and Doorways. She has served on the boards of Stray Dog Theatre, Springboard, The Big Muddy Dance Company, and St. Louis ARC. The Winter Family Foundation has supported three art exhibitions at the St. Louis University Museum of Art, with another scheduled. Her other commitments to the arts include scholarship support at St. Louis University and UMSL.